Books are rarely thought of as clutter. I did my best to protect my books when I began my journey to live with less. I saved books from childhood, boxed them up and moved them to wherever I lived even though I only opened most of them once (or never). Why was I holding on to books that I had already read or that I might read someday? “You have a garden” translated immediately in my brain to “you have a local library” and plenty of other sources to acquire books. Why did I need my own library? Like a garden, books give us an opportunity to grow, dream and share. Box them up. Put all of your books in boxes and put the boxes out of sight for 30 days. Did you miss them? If not, donate them. If you did miss them, what did you miss? Was it a certain book, or the idea of owning lots of books? Make a list. An electronic reading wish list will help you when it’s time to decide what to read next. It also eliminates the urge to buy a new book as soon as it’s available. I have a list of books I want to read, and a list of favorite books. If I want to re-read something, I check with my local library to see if it’s available. Give it away. Once you finish a book, instead of placing it on the shelf to collect dust, give it away. Give it to a friend, retirement community or local library. Share the stories and ideas that you enjoy. Quit. It is not your responsibility to finish every book you start. If you get to chapter 3 of a book and are bored and uninspired, give it away and move on to a book that you enjoy. Life is too short to read bad books. Buy Books. You can get books at your local library and from friends, but I also recommend buying books to support writers and artists. I don’t buy much anymore, but I do still purchase books. I love reading and am almost always in the middle of a book. I used to read two or three at a time, but now find that one is enough. I used to be comforted by the fact that when my book was finished, I had endless choices on what to read next, but when I started to examine my behavior, I realized that I rarely went to my book shelves for my next read. Instead, I bought a new book (or 2 or 3). Letting go of my books helped me to realize that I don’t really know what I want to read next. It’s allowed me to be more open to reading exactly what I need in each moment. I can also really appreciate books for what they really are; ideas, thoughts, words, inspiration, entertainment instead of just ink on paper. cookbooks. If you love to cook and have been collecting cookbooks for a long time, this will be challenging. Review your cookbooks and remove any book that you haven’t cooked from in the last year. Box them up for 30 days. If you don’t remember what you put in the box, donated it unopened. If you are holding onto a cookbook because it has one recipe that you love, copy the recipe and let the book go. ebooks. Digital books for your computer, Kindle or iPad don’t take up any space in your home, but those ideas, thoughts, words, inspiration, and entertainment take up space in your brain. Buy them when you are ready to read them and don’t feel compelled to save them. It’s unlikely that you will read them again. sentimental books. If someone that you love gave you a book, or you have a collection of books by a favorite author you may feel guilty getting rid of it. Less is not nothing, so hold onto a book if you want, especially if it makes you happy. If it’s stuffed in a box somewhere, take it out and photograph it or scan the inscribed page if there is one. Let go of the book and hold onto the memory. I keep a list of what I want to read and that helps when someone recommends a book. I don’t forget the title and don’t feel pressured to read it right way. I love books and know that this might be hard for you. Sometimes we are emotionally tied to books. Take it slowly. If you want to see what it’s like to live without your books, get them out of sight for a bit. See how you feel and how that changes your reading habits. If you are happy with the changes, take the next step and let go. Hey Courtney. This made me smile, particularly as I have just posted about my adventures with flat pack furniture and the fact that I am creating my own mini-reference library. I agree with you that books can become clutter however I would add ‘Reference’ to your ‘Special Books Category’ – I love having those books around to provide inspiration, for now anyway. Steve, I did have some business “reference” books, but they are gone too. I didn’t use them as much as I had planned and figure I can borrow them if I need them. WE are a homeschooling family and I have shelves filled with books on parenting and homeschooling. I will sometimes re-read a few of them, but now that I have been homeschooling for 5 ++ years I am lending them more than using them myself. I feel a need to let them go, because I want to declutter, but I am extremely attached to them. My fear is that I might need them as a reference and not have them available if I get rid of them. I keep playing this game in my head of “what ifs”.. what if I was in another country, how would I find this information? If I really needed the book after getting rid of it, could I get it on kindle?? I am getting myself ready to sell them all, still NOT wanting to do it all! Your blog has been very useful in this new journey of mine. thank you. For cookbooks, the best tip I’ve ever seen is to leave them on the shelf for the next year, and mark every recipe you use with a post-it flag. At the end of the year, it’ll be obvious which cookbooks (and recipes!) you’ve used, so you can safely chuck the rest. I don’t have any cookbooks (other than a Betty Crocker cookbook, which I put in the “reference” category rather than the “cookbooks” category), so I’ve never actually had to do this….but it sounds like great advice! I wonder if people hang onto books and display them just to show others how intellectual they are. Discuss! Or maybe they are a reminder to us about how much we’ve accomplished, or what we want to accomplish. For instance, if you have lots of travel books that might show that you have traveled or want to travel. In some cases it’s to show off to others, but I think in most cases, it’s personal. Books are both inspirational and aspirational. I don’t see my books as a wall of bragging rights or anything like that. I see my books as friends…comfort…feel good things. I know I have an emotional attachment to things, and I’m working on that. But I also have an emotional attachment to the stories and characters I read about. I have probably purchased my favorite 3 books about 4-5 times. I read them frequently, meaning once every few years, and as I drag the books back and forth to work, the doctor’s office, ballgames, ballet lessons…they get beaten up and torn. So I replace them. I know I’ll read them again. And my 13-year-old daughter is also an avid reader and loves the same genre. I would be completely broke if I hadn’t saved my books because she reads 2-4 per week…our library doesn’t have a good scifi/fantasy section. Having said all that, I’m listening to Courtney and getting rid of all the books I started and did not like enough to finish. And the duplicates. Sigh…I’m a work in progress! As a military family we move every couple of years and I have gotten pretty good at purging before and after a move. The one exception is books. I have hundreds and hundreds (maybe, gasp, even a thousand although I’m in huge denial). I found this blog because I was looking specifically for help in beginning to let them go. Anyway, my books are not an intellectual show and I never imply that I have read them all. I hope that people don’t make assumptions that all book owners are in it for the prestige. That could doom a lot of wonderful conversations and potential friendships. There is not a lot of stability in a military lifestyle and my books have been a comforting anchor, but addiction is addiction. Thanks for your tips and encouragement. A year or so ago we had about hmm 1200 books? We’re down to about 200 now. We used to do just what you did… buy them… read some of them .. hoard them all ! Move house, move the books, buy more.. keep going. On and On we went. We realised that it was just clutter. We didn’t need it. But it was hard to start to get rid of them. Better yet we realised that we could help someone else out by donating them to charity. Giving 4 boxes of books to a charity was an amazing moment, they were SO GRATEFUL. I could just picture people less fortunate than most people, who can’t afford to buy new books all the time, picking them up for next-to-nothing from the charity, and diving in for a good read. I’d definitely recommend do it. I would recommend adding “Work-related books” to the list. In some professions (medical, certainly) it is beneficial to have an office library of books that you can reference and cross-reference as necessary. And while many of these are now available as e-books, having four or five open to the page that you need on the table in front of you can be more helpful than trying to find the window that you minimized. Additionally, the act of paging through physical books allows for sudden inspiration if you pass over something on a page or in the index that you would not have otherwise considered. Thanks Raye, Some occupations do require reference books, but probably not as many as most people hold on to. Seems we always have more than we need in the book category. I agree with you that inspiration is delivered/received differently from a physical book. I agree–sometimes you really need a professional library, and even that needs updating from time to time. I’m a veterinarian, and am constantly trying to stay current in my field. Veterinary medicine books are usually $100-250 each, but even they become obsolete over time. Often, I don’t upgrade to the next edition of a book unless absollutely necessary, but when I do, I’ll donate the older versions to vet schools in Africa (there is a program for this). Hi. Thanks for this post. As a book lover, it has always been hard for me to declutter with books. I had to do this when they took to much place. I personnaly have another special category. I have some bools, a few, I keep because they’re specially important to me, and I want to hand them to friends or co-worker to make them discover the books. Laurent, I think passing on books to friends and co-workers is a great idea! We did this. We donated about 700 books to the library. We kept a total of 4, plus a half dozen cookbooks after I culled those, too. Now I use the library heavily, and even borrow library books on our Kindles. Like you, I will make the occasional purchase; like you, we want to support writers we love. I also bought a used (fifteen cents) copy of an out of print book that I will set free or donate once I have read.it (my library didn’t have a copy to borrow). One big thing to remember is that if you donate a book *to* the library, there’s no guarantee you’ll ever be able to get that book back *from* the library. Not just because other people can check it out, but because most libraries put a large amount of donations in their periodic book sales. It might never wind up on their shelves at all. That is true Robert. I work at a library and we dispose of about 70% of the books that are given to us. We may already have a copy, or they are out of date, or in bad shape, or not something we think people will read. I keep only the best & those I may use again. I LOVE paperbackswap.com, a free exchange (I only pay postage). I love that my book goes to somebody that wants it, I get to “recycle”, and I get a credit to get a book that I want. A friend of mine moved to Tokyo last week for a 6 month work assignment. She mailed me a large box of books that I’ll be “book sitting” for her. They aren’t taking up space in a storage unit, but she doesn’t have to make the decision to part with them just yet….and I’ve got a TON to read in the next few months! I dedinately like to hold onto books for two reasons: the sentimental connection and I’m a teacher. It makes it really hard with my new efforts to pare down. I can’t do anything about the teacher books but I have another idea for sentimental books, taking off the dust jacket and framing it on the wall! You free up shelf space and get to experience your memories. Plus its art! Thanks for the great post on such a sensitive topic! I found that when I posted a list of my unread books on my blog, I was able to acknowledge that I wasn’t going to read a lot of them and I let many go. I still ended up with about 55 books on my shelves I haven’t yet read. I am committed to mostly reading these before I get new ones, but I’m prepared for the occasional slip-up. I agree with you about quitting a book if you just can’t get into it. And I love your insight about the right book coming up at the right time, it’s true that we never really know what we’ll feel like reading next. Kim, It’s a really sensitive topic and I completely understand why! Nice post on a lovely topic! I have a soft spot for books too. My parents are book lovers, so as long as I can remember I have loved books (even before I could read :)). When I started to work a couple of years ago, I started to read less (less that I would have wanted too), but I did keep on buying books, some new, some second-hand. On top of that, my boyfriend and I would also receive quite some books as gifts, some literature, but also from visiting exposition openings. I think that now, more than half of the books in our bookshelves hasn’t yet been read. Since I didn’t renew our newspaper subscriptions this year, I started to read more books this year, and I love it. I don’t buy any new books (except for gifts to others), but just read from my own library (or borrow from parents’, friends’). I do have bought a second-hand book (which I have already read). And I actually won one here (Enjoy every sandwich). 🙂 Keeping myself from buying new books isn’t that hard. Just picturing my bookshelves is enough to know that I don’t need to buy another book. A couple of months ago, I reviewed a book for the website of a publishing company. As soon as I had reviewed it, I handed it to my mum (it was a ‘women’s book’ so I’m pretty sure my boyfriend wouldn’t want to read it :)). I’m now thinking of giving books that I’ve read to my beloved ones and friends also for occasions. I hope they won’t think I’m being ‘cheap’. Maybe a inscription on the first page like ‘”Read and approved by Sarah.” I hope you will enjoy this book as much as I did. Love, Sarah’ can make it more special? (Ideas and comments on that are very welcome!) And books that I didn’t like enough, I’ll just try to sell or donate to charity. Sarah, I think gifting books that have already been read is a great idea. You could also make a useful bookmark and include that. My favorite bookmark is a small laminated image of my grandparents. Simple and always makes me smile. I have clutter. Not so much in the clothes, kitchen items, general categories, and recently have begun tackling the books. Books are THE absolute most difficult, anxiety inducing exercise for me, therefore, they are the items I most need to declutter (both to stop drowning in them, but also because it causes me such angst). I find it easier to declutter popular fiction and bestsellers rather than animal/veterinary medicine books, but still…. Robin, eliminate the anxiety by boxing them all up and setting them aside. By removing them temporarily you can answer the “What If” questions and decide if you want to give them up or not. Thank you Courtney, I have started doing that this weekend. I’ve boxed up old veterinary texts and books. If I don’t need them in three months, out they go! This is a GREAT post. I am also a book-a-holic! LOL! Grew up with lots of books around me. I have pared down over the years, but still have a LOT of books. My motto is if I can find the information online then I don’t need the book…although that doesn’t always make it any easier. Good discussion! What about pictures? How do you get rid of the picture clutter? Especially old pictures? ARGH! I too am a life-long reader and book lover. For years I hauled around boxes of books I loved and was sure I would never part with them, but little by little I have been letting go of my many books. Buying a Kindle has helped me immensely. I now have many beloved books on this little device, as well as books I am currently reading. On my shelves I had many books I had read, and thought I would re-read someday. This spring I donated most of them to my local library and put the titles on my Kindle wish list. If I ever do decide to read one of them again, I can buy it. In the meantime, I am physically and mentally lighter without all those books. What a great feeling! No thanks. Books aren’t clutter and I’ll keep mine indefinitely, moving them cross country again and again. This is one area where I feel no need for improvement. Minimalism be damned. I’m with Kate S. Books are not clutter to me. 🙂 We do have a home library and most are in there but all of my children have bookshelves in their rooms as well as some in our home office. I also decorate (very simply) with books and I love the feeling they bring to the house. I love your blog and what a great email. You have inspired me to declutter my books (which I like you, have way too much to hold onto). I also like the idea of getting rid of this clutter and eyesore. I wanted to mention that http://www.amazon.com has a wishlist. That is where I add my books that I want to someday read. I also have many books. As an academic (in the humanities), it makes sense to own some of the books that will be reference material for larger (longer-scale) writing projects. Unlike professional books in the sciences, a majority of the ‘reference’ books I need are reasonably affordable. Still, there is plenty of fiction I hold on to just because I always have. I’ve been (slowly) letting go of that as well as of collections of academic material I no longer need. I am trying to be more mindful when I buy books, only buying those I love and/or will reread many times. The difficulty for me surrounds collections for a subject I don’t know if I’ll take up again. I’m rather poor, so re-buying the books would not be easy (even though I got many used). Many of those books are out of print. So far I am holding on to them, as I don’t know where my career will take me in the next year or two. I get a bit miffed with the often-heard minimalist chime of “get rid of books”, digitalise books etc. As an English mothertongue person living in a country which, despite its affluence, does not much value books/reading and hence does not have a very good library system, and NOT in English anyway, my books are of great value to me personally. I sort, I weed, I don’t keep everything. But I would never get rid of all or most of my books, because I can’t just go to the nearest library to read or reread anything, my library doesn’t accept any donations of 2nd hand books (if I gave mine away) and doesn’t order books for me either from other libraries or buy any new just because I’d like them. So, I buy books. I am hugely grateful that my travel no longer involves lugging many kilos of books home on the plane and that Amazon will deliver any book or DVD to me in English that I want. And yes, I use a Kindle app on my ipad/iphone, too, but not everything is available on Kindle in any language. I just keep it under control (and I’m quite generous!). Gotta agree with MelD here. Seems a lot of the minimalist bloggers lean to “get rid of EVERYTHING eventually.” To me thats not what minimalism and simplicity is about, and to say it is is kind of extremist and ridiculous. I’m a bibliophile, and I’m getting rid of the majority of my collection, but I will NEVER get rid of all of my books because to me that would detract value and happiness from life, which is the exact opposite of what minimalism is meant to do. I think it *is* periodically worth re-evaluating the motivations behind keeping things though. I think the reason many minimalist bloggers seem to “learn to get rid of everything eventually” is that there’s a positive cycle created by evaluating your need for, and disposing of, excess stuff. To me, the owning isn’t the big deal – it’s whether you own your stuff, or your stuff owns you. This is something I’ve struggled with in my decluttering efforts, as I’m sure most book-lovers have! Even romance novels were hard to let go of, especially the ones I’d really enjoyed. I’ve recently started reading on a Kindle Fire & I’ve realized that I don’t need to buy or keep any more paperback books. I’m currently in the process of clearing them out and finally making some progress. Most of my paperback novels are going to my sister or a friend. Some special interest books are being donated to the library. One exception is my clutter clearing books, most of which I’m keeping for the moment. I know this is crazy~ It prompts the question of when books on clearing clutter actually BECOME clutter! But for now I’m keeping the ones I still find inspiring when I get stuck. I think that eventually I will have absorbed everything I need from them and I’ll be able to let them go. I sure hope so! The other exception for me, is certain ‘special interest’ books. I have a collection of books & magazines on dogs, which include both training books and books on the history & pedigrees of the past. These are not available in the library, or something you could borrow from a neighbor or friend. Many were published by the national breed organization and are rare or out of print. If you can find them online, they are expensive. These I’m keeping, and if I ever get past using them I will offer them to other breed enthusiasts who will treasure them. I use a website called paperbackswap.com – don’t know if anyone has mentioned it yet as I’ve just skimmed the comments. Basically, you post 10 or more books to start with and get credits for the books that other people ‘order’ from you. Then you spend the credits ordering books from other people. All you pay is postage to mail them. If the book you want is not available, you put it on your ‘wish list’ and they notify you via e-mail when it is available. I’m very selective about the books that I order – they are usually books that I want to keep or give away as gifts (usually to the children in my family). I have a small shelf with books that are on my ‘bookshelf’ on the website so whenever someone orders from me, I know where to get it. I’ve gotten some GREAT books this way – books I never would have found out about unless I had been browsing thru this site. And books that would have cost me a LOT more than $2.47 – so great for gifts! Whenever I get low on credits, I head to Goodwill or the library (or my own book shelves!) to add books to my virtual bookshelf. I rarely buy books new anymore unless they are for my Kobo reader or books that require writing in them. Love, love, love Paperbackswap.com! SO slick! I recently gave some of my business books to the Half Price Bookstore, not because I wanted the money, but I wanted them to reach people who needed to know what is in them. It left several open shelves in my bookcase and I was able to display and yes see, some of the favored items I have around me. When you give things away you are making space for more peace and serenity. I still have too much but releasing those books felt so good I’ll do it again. Thanks for the nudge. OMG – you read my mind – I am a really organized person who HATES clutter and I’m very good about keeping things to a minimum. If it doesn’t have a “home” I get rid of it – no problem at all. So, this post was very, very helpful and touched a nerve. I cannot tell you how often I look at my bookshelves, my baskets full of paperbacks every single morning and think of a way to part with them. These suggestions will definitely help, thank you sooooo much! I have lugged several boxes of books with me for several moves now. I admit to being proud of my collection, and I know there’s a part of me that sees books as some kind of badge of honor, or something to show others how great I am because I have so many interests. 🙂 But my books aren’t me, right? I have slowly been getting rid of my books. With my husband in the Coast Guard we move so much that I am really trying to get rid of as much as possible. I find that I read more on my iPad and iPhone and rarely buy books anymore. I enjoy that I have what ever book I am reading at my fingertips anywhere I am. My only exception is the books I have bought for my twin boys. I feel that it is important for them to have a book to hold and flip through as well as read. My big problem is yearbooks. What do you do with school yearbooks? They are a very personal thing with all the signatures of classmates. I hate having to move that heavy box every time but I have no idea what to do with them. Perfect timing that I found this on Rowdy Kittens – I’m actually going through this right now with my Stephen King books that I’ve collected since I was 12 years old. I’ve already sold or donated ALL of my other books (except my favorite cookbooks I use on a regular basis and my favorite books from my early childhood) but I can’t seem to make the decision to get rid of the S.K. ones just yet even though I’ve already read them all and probably won’t be reading them again anytime soon. I’m moving in two months and they are already packed up in boxes waiting for me to make a decision. This is no small collection either so I make a point to look at all the empty space every time I pass by. I keep telling myself I can always get used copies if need be since they are a dime a dozen… but it’s been a tough decision!!!!! We donated our books to our local library for their used book sale – their largest annual fund raiser. In exchange, we we got a tax receipt. ah, i remember from a previous blogging job that posts about getting rid of books always, always result in a lot of comments. i’m a lover of books, a writer, the daughter of a writer, a reader, a former employee of both a small publisher and an independent bookstore, and i was an english major. i appreciate the way people’s homes look with lots and lots of books. but i live simply, on a small boat where it’s not practical to have many books. what works for me is to keep only about a dozen of my absolute favorite books, the ones i read again and again and again. i visit libraries often, i borrow books from friends, and at this point the books i buy come from library book sales, and then are donated back to the library when i’m done. someday i may have an e-reader, but i love the way books look and smell and feel. This really hit home! I am a book hoarder! I donate lots of books, but somehow, there are still so many books everywhere in my house! We are a household of 4 readers, so it adds up quickly. One thing about the library is that I end up with library book clutter! I have to request books through a shared network, and the wait is unpredictable (it’s taken anywhere from 3 days to 6 months to get a book), so I end up ordering multiple books, and then it’s either feast or famine! I like your idea of ONE book. Read and finish ONE book. I think that will be the ONE change I’ll start with. Thanks, Courtney, for a great post on a sticky topic! Wow a kindred spirit. I kept every book I ever enjoyed and had various places I kept them around my house including using my closet for books rather than clothes. I lugged them around every where I moved, even my college textbooks. the first to go were those textbooks, but I was sure I couldn’t get rid of the rest. Finally I got rid of all but approximately ten and have never been happier. The bookcase sold in less than one hour (it was huge) and freed up plenty of open space, so much so I was finally able to downsize to a studio apartment. While hard to part with the collections of Stephen King (I had every one he ever wrote) and a few other authors, it was the best decision I ever made. This post really resonated with me, Courtney. I have a very large collection of books, and in the last few months I keep looking at my overflowing shelf and know that I need to part with some. But being a literary lover and a writer, I have a very sentimental attachment to them. Today though, I took a very big step and listed about 10 of them on amazon and selected another 5 to donate to charity – a small step towards decompressing my life. Thank you for writing this! For me it’s become rather simple. I ask myself first “How many times have you read this book?” The answer invariably falls between zero and three times. The second question is “How many times have you dusted/rearranged/re-shelved this book?” And then finally “How many times do you honestly anticipate reading this book again?” When the dusting number is higher than any of the others – or even the combination of the others – it’s time to let go. And I do. I hang onto photography books and some art books. I checked your list. I need to read Strayed’s Wild. I probably need to hike the PCT. The first piece of furniture each of my children received (after the crib in which they slept) was a bookcase! Books are hugely important to my family and we each own hundreds, if not thousands. That said, your comment abt buying another new book versus reaching for one on your “to read” shelf resonated with me. The truth is, while owning books is a pleasure for me and I can’t imagine not living in a house with [paper, not electronic] books for me to touch and hold and smell and read, my local library can provide me with every book I long to read. PS. You’ll get a laugh out of the indignation I felt when a designer came to my house to help with my living room and arranged my books in an aesthetically pleasing manner…by height, size, and color. What?? And another PS. We have a table at work where we leave books for others. It’s an informal book swap. Amazingly, one person’s donation is another’s most-coveted read. I keep some cookbooks but I’m learning to recognise when they don’t have many recipes I want to make. the idea of the post-it flags above is great. I’ve kept some of my childhood books, because I want to save them for when/if I have kids, but I realise that will be a number of years. I’m just not sure I would find them again in a library or similar, and there’s something about passing on through the generations something that you read as a child. I also keep book series, like Harry Potter and His dark materials, because they are the ones I read more than once. But yes, I also recognise that when I want a new book, I seem to borrow something from the library rather than pick up one from my stack of 15 or so unread books that I have on the shelf. or buy them from the charity shop for 50p! I find those hard to resist! hmmmm. I really needed to read this! Although I gave almost all my books at one point in my life, when I was moving across an ocean, I’ve steadily gathered more though not at the same pace. And, I usually buy Kindle editions. Still, it’s time to sort through and see what I really need! Thanks for the encouragement. I was intrigued by your suggestion to buy books to support writers. An interesting thought! Like a lot of posters, the idea of giving up my books is hard. I grew up in a family that moved often. (My mom and I counted it up once, and I transferred schools 21 times over the course of my K-12 education.) I was always the “new kid”, and oftentimes the characters in my books were the only friends this quiet, shy child had. So my books aren’t just “things” to me. I still sit down and visit with Laura Ingalls, Anne Shirley, the March sisters, and many other dear companions from my childhood. I have started sorting through my books and trying to keep only those books that carry a “best friends” or “family” emotional value, and donating the rest. Another difficulty for me is the e-book dilema. I have plenty of e-books that I no longer have a need for, but how can I donate them? I couldn’t possibly just delete them. To me that would be like throwing a “paper” book in the trash! For now, I’ve just started archiving books I no longer need so I don’t have the visual clutter in my digital “library”. I do wish, though, that there was a way to pass on e-books to other people (and I mean give them away, not “lend” for a few weeks). Thank you for such a great post! For the past year I have been minimalising and have gotten rid of an entire bookshelf’s worth of books (none of which I have read anytime soon) and have hauled to multiple apartments and an entire other state, only to finally go through them and donate or sell almost all of them. When I tell people that I have been getting rid of books, re-buying any that I absolutely want to keep as an eBook for my Kobo (which I specifically bought so that I could support indie bookstores instead of getting a Kindle and only being able to purchase through Amazon), selling the ones I could, and then donating almost all of the rest to my local library, people are aghast! It’s like there is this mentality with so many people I talk to that “I could NEVER get rid of my books!” Countless friends and strangers eye me suspiciously, like I am a book-hater. I am always having to explain myself. I am always positive and informative, letting people know that there are options rather than having tons of books you never read! For years I was one of those people using books as a status symbol. People would come over to my apartment and be amazed at how many books I had. How many of those books had I read lately? Or even in the past year or even decade? Yeah, not a lot, but I sure owned them! Looking inside myself and realizing it was time to go through my books was hard, but I sure felt better after doing it. I’m currently saving for a trip to Antarctica in 2014, so knowing whatever books I sold would be turned into a life-long dream-turned-actuality was a pretty good motivational tool. Also, freeing up the space occupied by that bookshelf made our apartment’s dining room even more functional. I now can’t believe I ever had that much space! I am now going through the rest of the books on the other main bookshelf that got saved the first time and will be deciding which of the books I want to keep (such as if they’re not available as an eBook), re-buy as an eBook, or just donate to friends and the library. Yup, thanks again for such a liberating post! I look forward to sharing it with people so they realize that getting rid of their books doesn’t making them a bad, book-hating person, but maybe doesn’t know how to go through with finding new homes for their books. I hated even using the phrase “getting rid of books” because it’s so negative-sounding, but when I think of it as my books finding people who will love them and read them, because I haven’t, it makes me feel so much better! Perfect post, I really share your sentiments! Physical books are such beautiful and exciting objects, but generally becoming clutter in my life, as I move to downsizing my possessions and living in a tiny home (my van!). I try to keep all books to my kindle if they are available, otherwise I’m sticking to the ‘read it, pass it on’ rule. Unless it is a book that is very precious to me, such as Women Who Run With The Wolves. I think my dog eared copy will always be by my (bed)side. 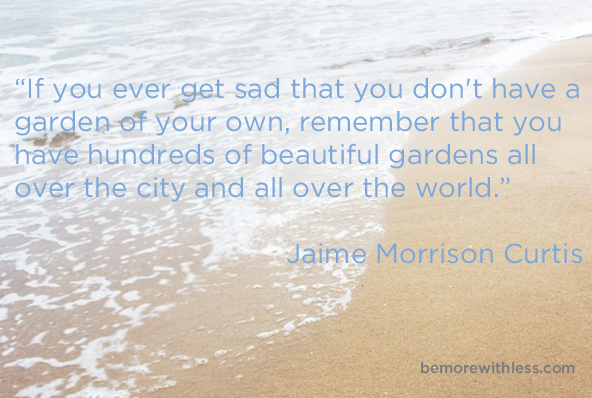 I love the Garden thought—I’m going to try to remember that one. I have some books I have been struggling (the past several moves) whether to keep or not–they are books I took from my grandmother’s house when she died. They aren’t anything too special: a set of Tarzan novels and some other 30’s era novels. They’re kind of charming, their covers kind of muted gem-colored. So-o-o…I’ve kept them for sentimental and aesthetic reasons. Really? I also like the idea of flagging cookbooks I use and evaluating over a year. It would help if some of them didn’t have such beautiful photography! Well, we currently still have just over 1200 books in our house, but we are getting rid of hundreds every year, and soon we will be down to a precious few. Like others, I am still getting over my ‘look at me, I am so smart/cultured/sophisticated, just look at all my books’ mentality! But what gets me even more than my vanity is the ‘oh, but you will pry my many books out of my cold dead hands – you must be a book hater’ if you ever dare talk about getting rid of books or liking an ereader. I have lots of books on Kindle and find it liberating. Yet I also love books – heck I MAKE limited edition runs of hand bound books! My pension plan is my collection of limited edition art books. Just because I don’t see the need to hoard every physical book I have ever had, or worship every bound bundle of paper as something precious does not mean I don’t love books as a physical object. But I will take quality over quantity any time – sometimes it is lovely to own a beautiful book, but often what I want is the information it contains, so an ebook or a library book I return will do just as well. I am a book lover too! Recently Apartment Therapy had a post about “Little Free Libraries” and I’m determined to set one up in my yard where I will feel great about offering my books to the community. The idea is a little, library on a post where passers-by are invited to “take a book, leave a book”. Because I love books and value creating community, I think this will be a wonderful way to send my books out into the world. Hope others are inspired too! I have been working thru decluttering my life for the last few months. I have removed my books, to the doorway in boxes, to store in storage bin. My mother asked why was I keeping them? For a month now every time I pass the boxes, I ask myself that same question. But I always feel a sense of loss at the thought of parting with them. Your article really resonated with me so hopefully I can work at finding a new home for the read books. This article was extremely timely. at last— this post really got me working on the last of my books– I bet I got rid of 500 books this past week…now I have only have — at most — 200. Why did I hold on to so many? back to work, loving your posts! I admit to a touch of look at me, I’m smart, can’t you tell by all these books? :) I’m still crying over some cookbooks I lost in a move and NO, I was not able to replace them. However, the time has come for me to re-evaluate and I finally found a de-cluttering credo that made sense to me – one book in – one book out. A serious need for breathing space, caused me to purge one entire bookshelf and lighten up two more. I still have three bookshelves and don’t see that changing in the near future. Books give me comfort and I re-read many of my favorites. Still, I’m eyeing three shelves of books that I think I may no longer need (I pick them up one by one and say good-bye to them like to an old friend) and the one book in and another out rule has taken root. So there is no uncontrolled influx of new books any more. A fair number of my books are dedicated to my interests like gardening, art and architecture, cooking, diy projects and such. My true, “can’t live without books” could probably fit in one bookshelf, but I am simply not ready to scale down that much. I shudder in horror at the thought, in fact I just ordered three project books which simply do not lend themselves to e-book ownership – but yes, three of my current books will go out the door in exchange. So you see I am passionate about my books and I rarely have books that I haven’t read yet. When I started culling my books I had collections of my favorite romance authors – but no more. Not a single paperback or romance book except the one I happen to be reading is allowed in the house. The other enlightening comment I found was – Magazines are seasonal creatures, rinse and repeat – summer picnics, Christmas decor etc. and they do get old and lose their appeal. So the first time I tackled the magazines, I got rid of half and six months later of another half. Then at some point I became obsessed with de-cluttering and now found a new credo for the magazines, I allow myself one of those magazine savers full of general mags and two for my garden magazines since I’m still a passionate gardener and love the visual input. I think true minimalists have no idea of the deep emotional attachment a bibliophile has to their favorite books. I read only non-fiction and have a terrible memory, so letting go of books feels like letting go of the information I just aquired. It’s usually stuff I continue to reference, some more than others. I also love to mark up my books for reference. I have a kindle but don’t enjoy it nearly as much as a physical paper book! I hope to be able to let go and go minimal and digital, but I’m finding it to be very difficult. My thoughts about this subject have sort of evolved over the years:, from: NO WAY! To: alriiiight, I guess I could get rid of a few….to: How many boxes do we have?? Hmmm…will it be enough? Now that I’ve rid myself of most of my collection (save for my bible, a few inspirational books, and my copy of Salem’s Lot) I find I’m both reading more, and having a greater appreciation for e local library! Another issue that comes into play here is finances- for me, anyway. I simply cannot afford to buy every single book that looks interesting to me. $10-$20 for fiction is just too steep, not to mention the price of cookbooks and reference lit. So, to all of you that have trouble getting rid of your treasures, perhaps it helps to know that some (maybe most?) of the people that buy second hand books would not want/cannot pay full price for them. Giving them away (or selling them Ina garage sale) will share the message/information which you find so valuable!